Things are still in full “Valentine’s Day” mode at our house. And the decor is slowly rolling out. So I was excited when DecorArt offered me the chance to team with them** and create a project using a non-traditional surface and Americana Multi-Surface Paint. This is the project I came up with, inspired by Christina’s intertwined heart made from old chair rail scraps. I didn’t have any chair rail scraps, but I knew immediately what I wanted to use! A set of old wooden shims I had leftover from another project. I love how rough they are, with the knots and imperfections. I also picked up a wood cut heart to us as the backer and a decorative script ‘Love’ from Michaels. The first thing I did was line up the shims side by side alternating which end was the ‘thick” end and which was thin. Remember that shims are actually tapered to help ‘shim up’ things like cabinets and door frames etc. So they aren’t flat when you lay them down flat. I wanted the surface of the heart to be rough, so I got that look by alternating them. Next I used a coping saw to cut out the heart shape. You could use a hacksaw if you don’t have a coping saw, but anything larger that that would probably destroy the shims. They are super thin and want to crack. Once I had all the shims cut, I hot glued them onto the wooden heart and sanded the edges with course sandpaper just to knock down the splinters. I didn’t sand the flat surfaces since I wanted the texture to show. Next I added some American Multi-Surface paint to a styrofoam tray. (I used the Cottonball, Lipstick and Pink Cadillac colors)This was the perfect paint of for the project because it sticks to almost anything! It was great for getting into all the crevices and cracks of the shims. Like the other supplies for this project, Americana Multi-Surface paint is available in Michaels. Visit the DecoArt Multi-Surface website for more crafting ideas and inspiration. I glued a little piece of twine on the top in case I wanted to hang it, but I decided that I liked it propped up in a vignette much better. 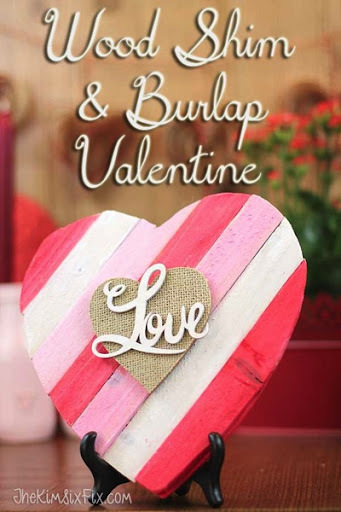 It is so cute and rustic yet fits in well with the rest of my Valentine's stuff. I think I'm going to incorporate it into this year's mantelscape. If I ever get around to it! **This post was sponsored by DecoArt and Michaels. I received compensation for my time and supplies, but the project ideas, tutorial and opinions are my own. I was not told what to make, or what to write.